Opening next weekend is director Jay Roach’s (Austin Powers) political comedy The Campaign, and we’ve been provided with some swag from the film to giveaway to some of our lucky readers. For those unfamiliar, Will Ferrell stars as an incumbent congressman who is surprisingly challenged by a green and inexperienced character played by Zach Galifianakis in a North Carolina race. Ridiculousness ensues. Hit the jump to find out how to enter and to see what you can win. Check out the official site for The Campaign right here, and click here for the film’s Facebook page. The pic opens on August 10th. The fine print for the contest is included below. Bueno suerte! When long-term Congressman Cam Brady (Will Ferrell) commits a major public gaffe before an upcoming election, a pair of unscrupulous power brokers plots to put up a rival candidate and gain influence over their North Carolina district. Their man: naïve Marty Huggins (Zach Galifianakis), director of the local Tourism Center. At first, Marty appears to be the unlikeliest possible choice but, with the help of his new benefactors’ support and a cutthroat campaign manager, he soon becomes a contender who gives the charismatic Cam plenty to worry about. As Election Day closes in, the two are locked in a dead heat, with insults quickly escalating to injury until all they care about is burying each other. It’s a mud-slinging, back-stabbing, home-wrecking comedy from “Meet the Parents” director Jay Roach that takes today’s political circus to its logical next level. Because, even if you believe campaign ethics have hit rock bottom…there’s still room to dig a whole lot deeper. “The Campaign” also stars Jason Sudeikis as Cam Brady’s loyal but increasingly overwhelmed campaign manager, Mitch; and Katherine LaNasa as Cam’s single-minded wife, Rose. Dylan McDermott stars as Tim Wattley, tasked with transforming Marty Huggins’s public image; with John Lithgow and Dan Aykroyd as the powerful Motch brothers, the money behind his implausible bid for Congress; and Brian Cox as Marty’s father, retired political operator Raymond Huggins, who cannot fathom what any of them see in his son. 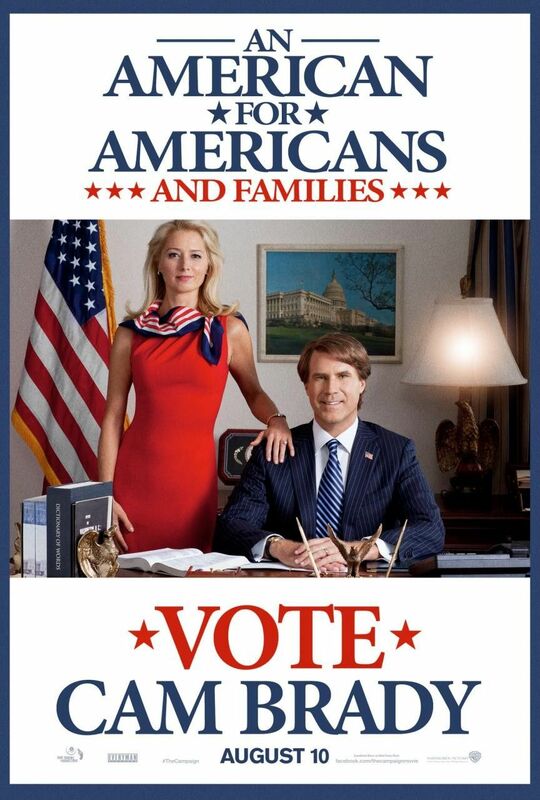 Directed by Jay Roach (Emmy Award winner for HBO’s “Recount” and Emmy nominee for HBO’s “Game Change”) and written by Chris Henchy & Shawn Harwell, from a story by Adam McKay & Chris Henchy & Shawn Harwell, “The Campaign” was produced by Will Ferrell, Adam McKay, Jay Roach and Zach Galifianakis. Amy Sayres, Jon Poll and Chris Henchy served as executive producers. The creative filmmaking team includes director of photography Jim Denault (Emmy Award nominee for HBO’s “Carnivàle” and “Game Change”); two-time Oscar®-nominated production designer Michael Corenblith (“How the Grinch Stole Christmas,” “Apollo 13”); editors Craig Alpert (“Knocked Up,” “Borat”) and Jon Poll (“Meet the Fockers”); and costume designer Daniel Orlandi (“The Blind Side,” Emmy winner for “The Magic of David Copperfield XI: The Explosive Encounter”). The music is by Theodore Shapiro (“Marley & Me,” Emmy Award nominee for HBO’s “Game Change”). Warner Bros. Pictures presents a Gary Sanchez/Everyman Pictures Production, a Jay Roach Film, “The Campaign.” It will be distributed by Warner Bros. Pictures, a Warner Bros. Entertainment Company.